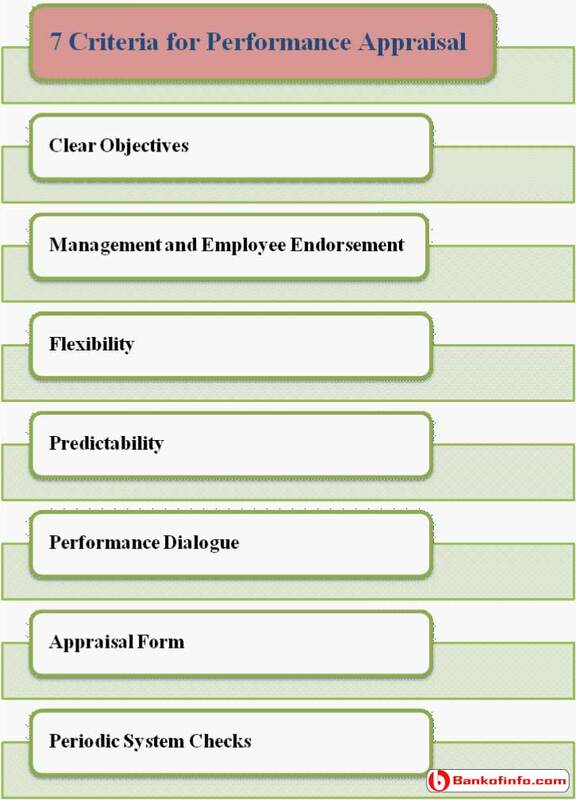 Clear Objectives: A good performance appraisal – should be built around unambiguous objectives. These objectives should cover all levels and areas of the organization and reflect the needs of each. The appraisal system should be clear in its purpose. Management and Employee Endorsement: To be effective, the appraisal system should be supported by the entire workforce. This includes management support for possible expenses such as additional training, employee meetings, and appraisal forms and other materials, and staff time. Flexibility: An organization must design its system with enough flexibility to adapt to any changes that might occur. Predictability: The timing of the performance appraisal and any other feedback sessions should be predictable. For example, some organizations have an annual performance appraisal close to the hiring anniversary date of the employee. This enables the employee to prepare for the evaluation. Performance Dialogue: Performance discussions between the rate and the employee are perhaps the most critical component of a successful performance appraisal system. Appraisal Form: The importance of an appropriate appraisal form should not be overlooked. Many organizations simply adopt “standard” form the may or may not be tailored to their goals and objectives. Periodic System Checks: Systematically evaluating the validity of tall performance appraisal system should be a key feature.